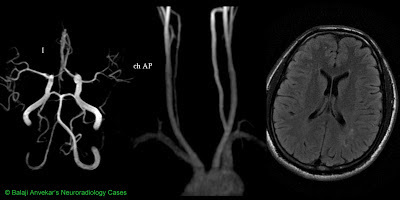 A 30 yo female with migraine like symptoms. Not responding to treatment. 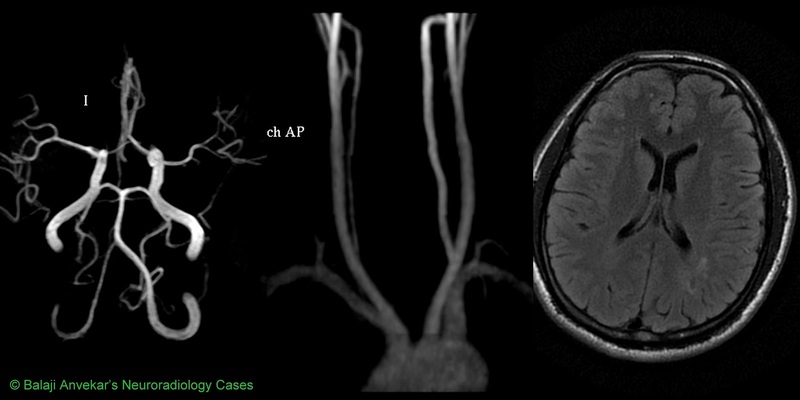 3 D TOF Non contrast MR Angiography of Brain shows sparsity of cortical branches of left MCA compared to left. 2 D TOF Non contrast MR Angiography of Neck normal. Brain FLAIR and Diffusion images unremarkable apart from few ischemic lesions in left parietal peri ventricular white matter. Further evaluation : positive for Antiphospholipid Antibody. Syn: Antiphospholipid syndrome, APS, APLS, Hughes syndrome. An autoimmune, hypercoagulable state caused by antibodies against cell-membrane phospholipids that provokes blood clots (thrombosis) in both arteries and veins as well as pregnancy-related complications such as miscarriage, stillbirth, preterm delivery, or severe preeclampsia. There are also associations between antiphospholipid antibodies and headaches, migraines, and oscillopsia. Some studies have shown the presence of antiphospholipid antibodies in the blood and spinal fluid of patients with psychological symptoms. There is autoimmune production of antibodies against phospholipid (aPL), a cell membrane substance cardiolipin (anti-cardiolipin antibodies) and β2 glycoprotein I. The term "primary antiphospholipid syndrome" is used when APS occurs in the absence of any other related disease. APS however also occurs in the context of other autoimmune diseases, such as systemic lupus erythematosus (SLE), in which case the term "secondary antiphospholipid syndrome" is used. In rare cases, APS leads to rapid organ failure due to generalised thrombosis; this is termed "catastrophic antiphospholipid syndrome" (CAPS) and is associated with a high risk of death. Antiphospholipid syndrome is diagnosed with blood tests. Requires treatment with anticoagulant medication such as heparin to reduce the risk of further episodes of thrombosis and improve the prognosis of pregnancy. Warfarin/Coumadin is not used during pregnancy because it can cross the placenta, unlike heparin, and is teratogenic. i'll probably be back to read more your site carries good data all in favor of readers.